There was a time when I didn’t have the absurd game catalog that I sport today. I’m not bragging - I would quickly give up my library for more time to spend with some quality titles. The problem with getting older is that games become more affordable and free time becomes less available. I hate to admit that I’ve never finished "Mass Effect" because every time I sit down to play, I get sidetracked with something seemingly more important, like work, family or sleep. The majority of my gaming is portable, predominantly iPhone and iPad, simply because of convenience. I do steal some late night sessions with my Xbox or PS3, but I have to limit those experiences to quick interactions such as "Super Meat Boy," "Zen Pinball" or the occasional "Battlefield 1943. "My childhood was littered, though, with constant gaming for lack of other things that interested me or my friends. Sure, we’d go out and play, but time moved slower and there was always a couple of hours available to pop a game in the Atari, Coleco, NES or Genesis (or PC! ), regardless of how awful the gameplay turned out to be. My menu of options was quite limited back then, which meant that sometimes I would become quite obsessed with games that were simply awful. Here are ten of my favorite horrible games - please include yours in the comments! 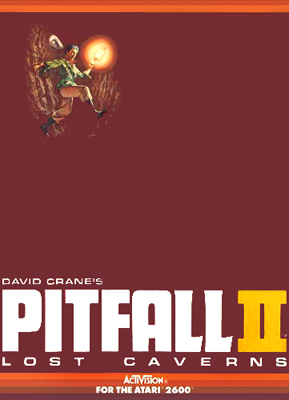 Yes, I realize that Pitfall II was a groundbreaking game for the Atari and platform games in general. 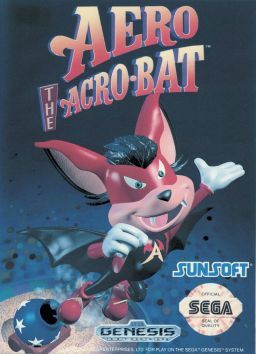 This also happened to be the very first game that I beat, at the tender age of 5, in fact! The game, though, required ridiculous patience. Identifying the single ledge that had a special jump that triggered a balloon was enough to make anyone mad with rage. Follow that with the final climb through bats and vultures and bats and vultures (again and again and again), any mistake in timing resulting in falling all the way to the bottom was infuriating. The only true positive from beating Pitfall II as a child is that Super Meat Boy does not really phase me... at all. 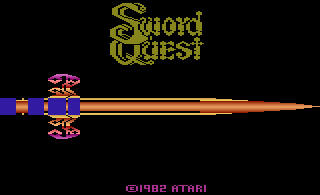 Swordquest was some sort of contest game - there were clues that inside the game needed to solve a real world puzzle. I never knew that. I just played this game (and the other Swordquest) again and again without any purpose. There was no save, so I just thought that I was running from room to room collecting items that would eventually bring about a grand end-state. Instead, hours of my life were spent running around with the notion that a purpose would present itself - and it never did. The music from the Smurfs game still haunts my nightmares. Yes, I did rescue a couple of Smurfs from Gargamel, but most of the time I was cursing out the screen because of the mind numbingly impossible jumps (which was difficult, because at the time I didn’t know any curses)! The game was so frustrating that I eventually decided that if the Smurfs cannot in a world of fences or bushes, they do not deserve to be saved. Fly a plane through some hazards and unlock a door - that’s fairly easy, right? Now fly through the inside of some wacky building with pipes and water hazards - still not bad. Now try to make it to the end without getting hit by a giant bouncing ball... Yeah. Looping is an incredibly bizarre joystick and shooting game that defies reality and rides the fine line of too difficult and satisfyingly successful. The music is great, but the premise is so overwhelming weird that it falls under the “what the heck did I just spend 3 hours playing?” category. I can imagine a 2012 sequel could put sense the insanity, but for now, I’m still scratching my head. 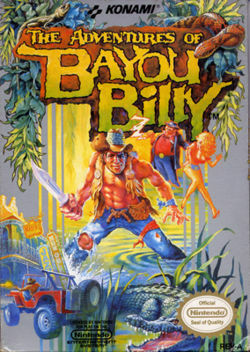 I do not even want to write about Bayou Billy. I was terrible at this game! 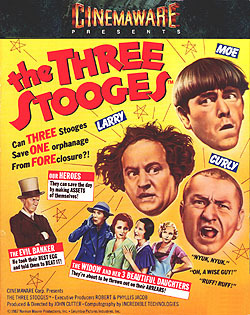 I know that’s an unfair way to judge a game, but the only was I got past the first level or two was with Game Genie - and that went for all of my friends as well. I think I made it to first on-rails shooting level only a couple of times without completely dying. Yet I kept trying, day after day, because I really had no other option. In the late 80’s, MTV had a game show that was actually based on music. I loved the show because it didn’t involve music videos, which I was too young to enjoy, and contained PG-13 level humor, which I was too young to understand. Somehow I was given the NES version of the show, which I played over and over again until I memorized all of the questions - otherwise, how would I know ANYTHING about Jon Bon Jovi? The game wasn’t broken, except that a 9 year old could easily win if he or she happened to play for more than 10 - 20 hours a week. I showed them! This game is impossible. 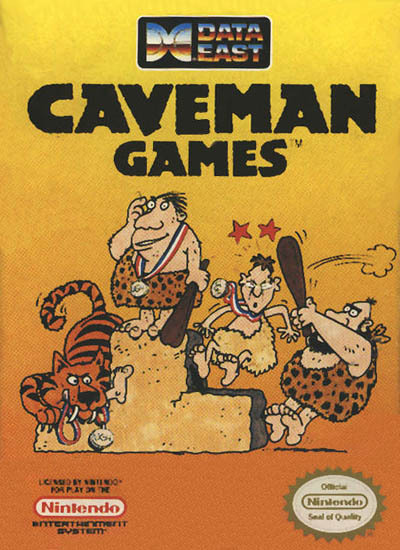 There’s no other way to describe the mildly entertaining Olympic-like exploits of these cartoony cavemen. Young gamers may know some Wii games that are merely based on shaking the controller endlessly - this was an early variation that required the player to repeatedly hit the “a” or “b” button at a machine-like pace. We bought a “turbo” (read *cheat*) controller specifically for this game and it made it much more interesting. My hands still hurt from the pre-turbo days. This game looked great. 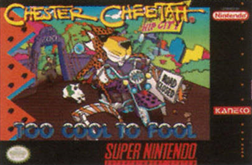 At the time, Chester Cheetah was one of the sharpest looking cartoon-like games out there. The game even had a cool platform twist, which was that Chester would be invincible whenever he was dancing. Unfortunately, the designers saw fit to use that skill against Chester as often as possible. One level includes some fast-action boat platforming on the high seas - every move must be perfect or splash! Toward the end, almost unavoidable, is a nice dancing power-up that changes the music and sends Chester right into the water. Oh - did I mention this game is based on a character from a bag of cheese-covered junk food? Yeah. Gross.